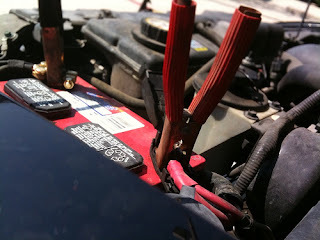 USGBC Blog: May I Borrow Your Jumper Cables? “May I borrow some jumper cables?” The brick building asked the building next door. The brick building’s energy use was out of control; It needed to kick-start its efficiency. The building next door answered with Energy Jumpstart, the new pilot prerequisite in USGBC’s Pilot Credit Library. USGBC hopes that this pilot can act as a set of jumper cables to stir up a segment of the buildings market that has the potential to make huge energy efficiency gains. On March 1, when the third public comment period for LEED 2012 opened, USGBC launched Pilot Credit 67 (aka Energy Jumpstart), a Pilot Alternative Compliance Path for EA Prerequisite 2 in LEED 2009 for Existing Buildings: Operations & Maintenance. If you’re familiar with LEED, you know each LEED prerequisite has mandatory pathways for compliance. For Energy and Atmosphere prerequisite 2, the traditional entry point for most buildings has been an ENERGY STAR rating of 69, a benchmark that certain market segments, such as older buildings, have a particularly tough time meeting. Cue Energy Jumpstart, an alternative path for this prerequisite (and the first pilot alternative compliance path ever), targeted at older buildings with energy challenges. Projects pursuing the pilot must show an energy improvement of 20 percent over a 12 month period, as compared to a three year baseline, qualifying them for initial certification at the Certified level. Keep in mind that USGBC wants projects to recertify – so these projects have the opportunity to come back into LEED at Silver, Gold or Platinum in the future! USGBC and the market can work together to determine the demand and effectiveness of a performance improvement path for LEED. Obtaining full market buy-in and demonstrating demand for a pathway like Energy Jumpstart is essential for the success of this option in LEED – the more projects that use the pilot prerequisite to jump into LEED, the better. Let’s get all buildings running efficiently. Let’s let all leaders lead. And let’s put a hand out to those who need a little help making a big difference. Some building managers inherit new, super-efficient buildings, while others must toil in older, less efficient buildings – often with limited funds – to cut consumption. I recently heard a great analogy that likened an alternative path for EA PR 2 compliance to teaching in an inner city school… that EBOM should be like a rating system for teachers. One is not necessarily a good teacher because he or she teaches at a prep school where kids were already scoring high before they got there; one is a good teacher if he or she improves a student’s performance in the time that is given, even if these students were very low scoring inner-city kids to start with…some would say that is a more meaningful indication of progress. Thanks for all your work on this – think it will have a big impact if it can be widely adopted! Looking forward to seeing how this goes!